There's no doubt that NYC is the best place to raise a family, but city life can be a lot to handle when you're expecting. 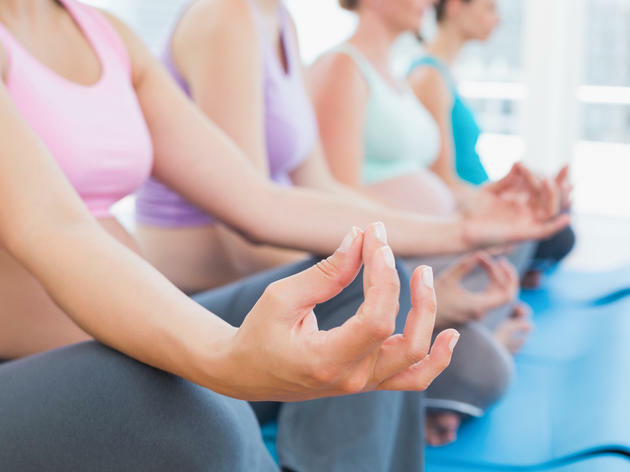 Luckily, future moms looking for a soothing retreat have some incredible prenatal yoga classes to choose from. These fitness centers and studios provide stretching and breathing exercises to prepare women for labor, plus a much-needed dose of relaxation. The best part? Several of these spots offer youth fitness classesto keep you and your little one active once they arrive! Ease pregnancy anxiety with relaxation techniques, breathing exercises and yoga postures at this family-focused center that offers a wide range of resources for parents-to-be. Enhance postnatal recovery with abdominal and pelvic floor toning, and take advantage of pilates, childbirth classes, thai yoga massage and more. Yoga: Mondays 1–2pm, 5:45–7pm; Tuesdays 12:30–1:30pm, 7–8:15pm; Wednesdays 1–2pm, 5:45–7pm; Thursdays 12:30–1:30pm, 7–8:15pm; Saturdays 9:30–10:45am, 12:15–1:15pm. Pilates: Tuesdays 5:45–6:45pm; Wednesdays 7–8pm; Thursdays 5:45–6:45pm. Drop-in class $25, five classes $100, 10 classes $200, 20 classes $360. This Upper West Side studio preps expecting moms at all stages of pregnancy for delivery through various movements and poses that strengthen and tone crucial muscles and organs. Adults are guided through 90 minutes of practice, helping to alleviate common discomforts like swelling, back pain and varicose veins during labor, plus breathing work and meditation to keep mom and the baby calm. Wednesdays 7–8:30pm, Fridays prenatal community class 10:45am–12:15pm, Sundays 3:30–5pm. Drop-in classes $14, community class pay-as-you-wish (suggested donation $6). 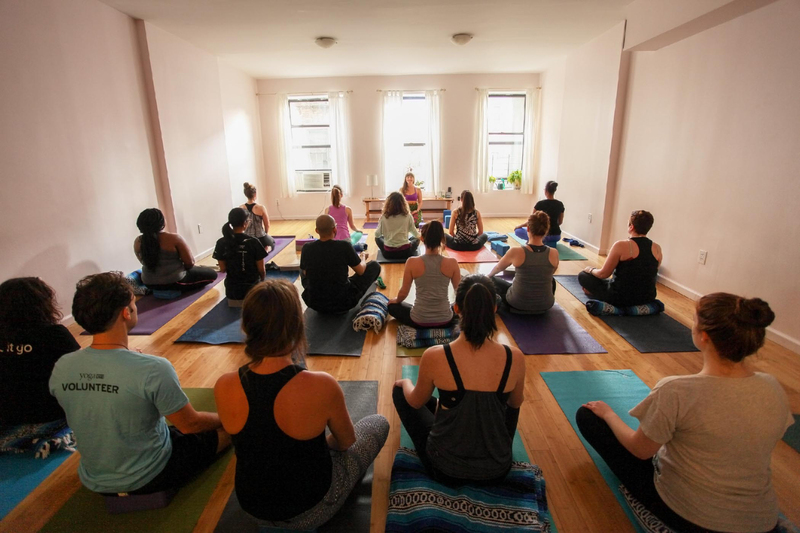 This Williamsburg yoga haven guides students through gentle stretching and muscle-toning in pre and postnatal yoga and pilates classes. In addition to physical strength and fitness, instructors aim to foster mental and spiritual confidence throughout pregnancy. A breastfeeding group helps continue the sense of community with educational discussions before and after labor. Schedule varies, see website for class times. Drop-in classes $22 (includes mat rental), 18 and uder $15; 5 classes $90, 10 classes $170, 20 classes $320; montly unlimited $99. New students received two weeks unlimited for $40. The iconic institution, which was founded in 1874, hosts all manner of programs for families, and this class series focuses on future moms. Strengthen specific muscles and learn to breath more fully over eight weeks of instruction in the Cardio Court Studio. Saturdays 12:35pm–1:25pm, 8 sessions beginning April 18 $200. Call for prorated pricing on program which began Jan 31. Expecting parents can join instructors from the Prenatal Yoga Center for classes which help to strengthen the uterus and pelvic muscles, improve circulation and increase overall comfort during pregnancy. Participants are encouraged to ask questions and discuss issues or concerns throughout the intimate program. Sundays 10:30am–noon. Drop-in classes $23, four sessions $85. Call to register. 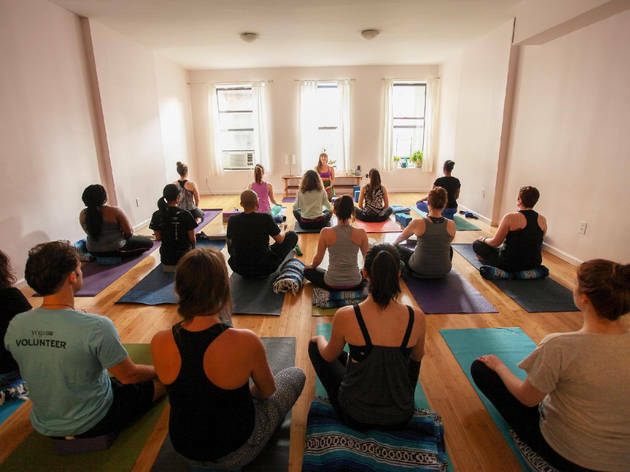 Trained professionals lead a variety of classes at this Brooklyn studio, but pregnant yogis will want to get in on the Gentle Flow Basic class. The practice combines yoga postures, breathing and meditation at a slow and steady pace that's perfect for expecting parents. Check out other baby courses offered at the center as well. Schedule varies, call for class times. Drop-in classes $25, five classes $100. 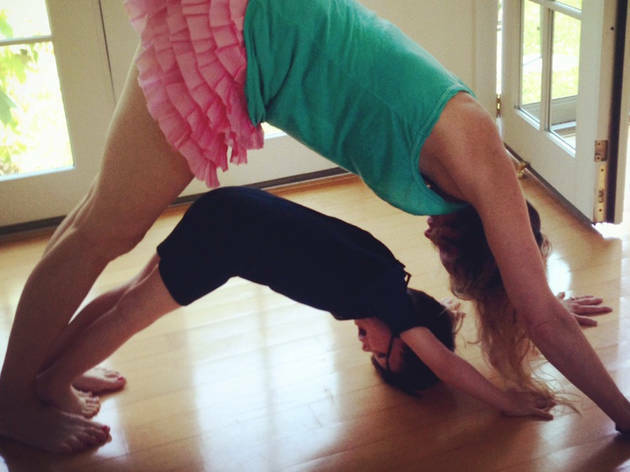 The Jewish Community Center hosts Mary Barnes, founder of Yoga for Two, for this six-session program. Students will learn the Barnes Method which combines Anusara yoga, breathwork, alignment, sound vibration, strength training, therapeutics and community. Through the flowing class, Mom and baby will prepare for the birthing process. Sundays 4:15–5:45pm, starting March 1. Six sessions $190.